The extremely colorful creature you see on the left is the larval stage of the Stinging Rose Moth. 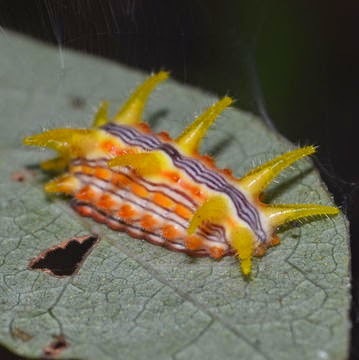 Is it the most colorful and weird caterpillar you have ever seen or what? The Stinging Rose Moth is endemic to North American forests, occurring from New York to Florida, west to Missouri and Texas. Despite its widespread distribution, the species is considered to be rare due to the low numbers of reported sightings. 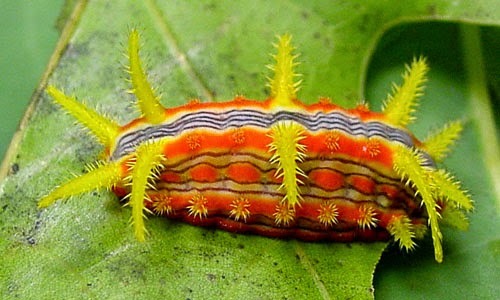 Fully-grown caterpillars range from 3/4 to 7/8 inch long, with the basic color being yellow, orange or red. Their body features pairs of long, horn-like, bristly spines and clumps of smaller spines. The large spines are usually yellow. During this stage, the species is easily distinguished by the characteristic broad purplish stripe that runs down the midline of the back. Within the stripe are narrow whitish lines that are sometimes interrupted by constrictions in the stripe. Red, white, orange and purple lines may occur along the sides. 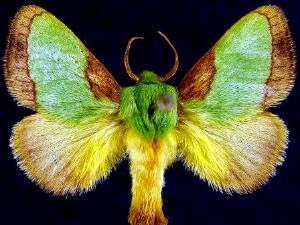 Adults (moths) have a body featuring combinations of green, brown and yellow. The wingspan is 2.3 to 3.0 cm. The coloration of the species is probably a form of aposematism, a warning signal of its poisonous nature. 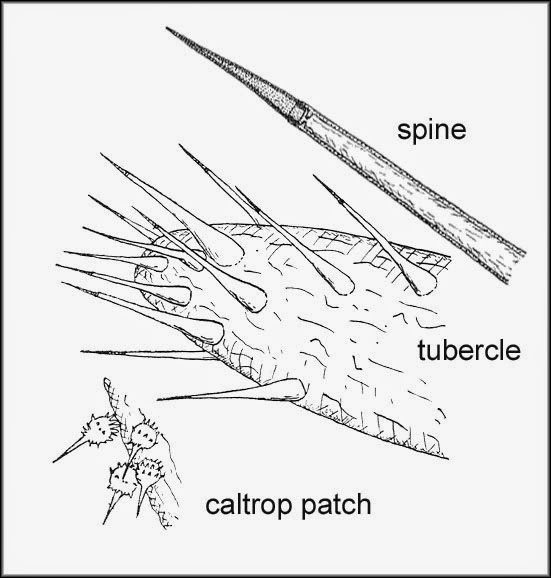 The black-tipped spines [see illustration below] have poisonous glands at their bases. When touched, they break off and release venom inside the skin. 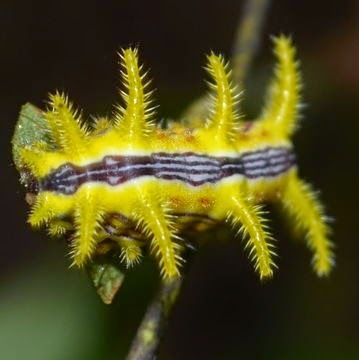 Although not lethal to humans, it may cause a hypersensitivity reaction resulting in pain, irritation, skin rash, and other complications referred to as "stinging rose caterpillar poisoning". - For more photos of this amazing caterpillar please click here.